Here is a cardigan pattern to top all cardigans with its wonderful attention to detail. A bold curvy scroll lace pattern creates a gorgeous statement on the front of the cardigan, extending to the generous collar, which can be worn as shown or buttoned up like a turtleneck. The same scroll lace is repeated on the belled sleeves. 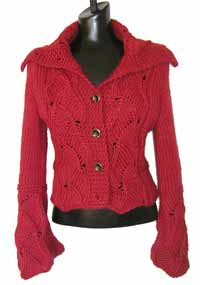 Beautiful shaping is accentuated with reverse Stockinette stitch seams on the back, front, and the sleeves. The length is slightly cropped. Big wood buttons complete the detailing. This is the masterpiece you have been waiting to make for yourself! 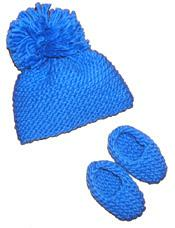 Knit in a popular wool/mohair blend yarn that comes in an amazing range of colors. Ideal for an "advanced" intermediate knitter.